Given the rise of the progressive wing of the Democratic Party, it’s completely rational to assume that this wave of new leftists are the ones trying to unseat Nancy Pelosi as Speaker of the House, but that’s not the case. In fact, progressives have allied with Nancy Pelosi. I'm supporting Representative @NancyPelosi for Speaker of the House because we have a lot of work to accomplish and we need a leader who knows how to get things done. As we head toward the 116th Congress and reclaim our Democratic majority, we believe more strongly than ever that the time has come for new leadership in Congress. We are thankful to Leader Pelosi for her years of service to our Country and our Caucus. She is a historic figure whose leadership has been instrumental to some of our party’s most legislative achievements. However, we also recognize that the recent election, Democrats ran and won on a message of change. Our majority came on the backs of candidates who said that they would support new leadership because voters in hard-won districts, and across the country, want to see real change in Washington. We promised to change the status quo, and we intend to deliver on that promise. Sixteen Democrats formally promised on Monday to vote against Nancy Pelosi’s bid to be House speaker, but the final letter didn’t include the signature of one House Democrat who is considering a challenge to Pelosi, Rep. Marcia Fudge, D-Ohio. Fudge signed a draft copy of the letter first obtained by the Washington Examiner Monday morning, which had 17 signatures on it, but her name was removed from the final copy. One possible reason Fudge is absent from the letter is likely due to her potential challenge. In 2016, Rep. Tim Ryan, D-Ohio, left his name off of a similar letter when he was considering a run against Pelosi — Ryan ultimately jumped into the race and lost. 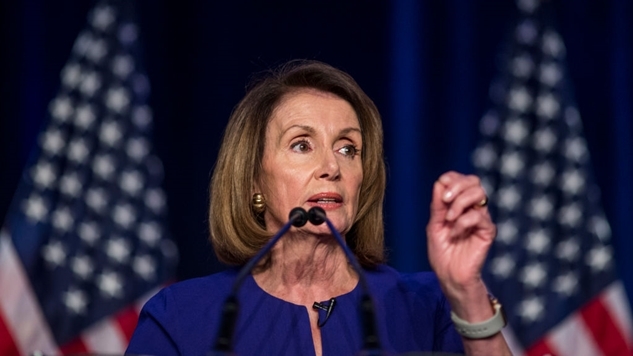 There’s also a possibility Fudge could find a way to support Pelosi if they reached some agreement; the lawmakers met Friday to discuss the ongoing battle. This sure looks like classic Democratic confusion, where a group is going for a power grab without any real plan in place. Is Pelosi’s replacement Marcia Fudge? Is it Tim Ryan? The problem that this group of Democrats are running into is that they just don’t have the numbers to unseat Pelosi—especially in the wake of Pelosi cutting deals with the progressive wing of the party.